Trumpet Virtuoso Doc Severinsen was leader of the Johnny Carson hosted "Tonight Show" from 1967 to 1992 while having a prolific recording career. 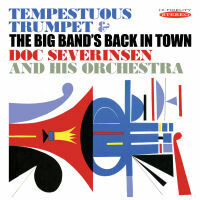 Tempestuous Trumpet / The Big Band's Back In Town, both from the early 1960s and produced by Enoch Light, offer the listener exciting big band music with excellent trumpet playing. First time on CD and re-mastered.